Acer Aspire V Nitro VN7-591G-792U is a budget priced modern gaming laptop with a mid range GTX 960M dedicated graphics card, better internet access with the 802.11ac WiFi, four stereo speakers and some high end main technical specs including the powerful quad core 4th generation Intel i7 4720HQ processor (6MB L3 cache) at 2.60GHz up to 3.6GHz with turbo boost and the ability to handle 8 threads in parallel with hyper threading and an impressive Passmark benchmark score of 8086 on 21 May, large amounts of memory- 8GB DDR3L SDRAM and hard drive- 1 TB Serial ATA HDD at 5400rpm spindle speed and 64-bit Windows 10 Home operating system pre-installed. NVIDIA GeForce GTX 960M has the 2GB GDDR5 dedicated video memory with a video card benchmark score of 1750 as of today and will let you play most current games at high settings and Full HD resolution and you will need to lower the settings for very demanding games like Assassin's Creed Unity. 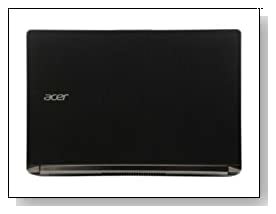 Black Acer Aspire V Nitro has a solid plastic chassis, looks modern and sleek, weighs 5.29 pounds and measures 15.34 x 10.14 x 0.86 to 0.94 inches- average thickness and weight. 15.6 inch non-touch diagonal LED backlit widescreen display is non-touch (which is the case for most gaming machines) but has the clear and sharp display with the Full HD 1920 x 1080 pixel resolution and horizontally and vertically larger viewing angles of IPS panel. Apart from the GTX 960M for gaming performance, it has the Intel HD 4600 integrated card that the system will switch to automatically to save on power usage. You have the HD Audio Support and four integrated stereo speakers rather than two like on most laptops and this will help with enhanced sound when you’re gaming and you will feel more a part of your game and the webcam is high definition with 1280 x 720 pixel resolution so it offers decent picture quality for live videos or taking still snapshots and has an integrated digital microphone. Keyboard is backlit for typing or gaming easily in dim light, includes a 10-key numeric pad as well as a Precision Touchpad that supports the current touchpad gestures of Windows 10. 4605 mAh 3-cell lithium ion battery will only last for 3 hours or so for video watching or web browsing and around two hours for gaming as this is a powerful gaming machine with Full HD display and the Thermal Design Power- TDP is 47 watts which doesn’t help with a longer battery life (focus here is on performance rather than power usage). Acer Aspire V Nitro doesn’t have an Optical DVD drive but the latest 802.11ac wireless with more speed and larger coverage, Bluetooth 4.0 to connect to other Bluetooth devices wirelessly, 10/100/1000Mbps Ethernet with RJ-45 connector, 3 x USB 3.0 ports, an HDMI output to connect to external monitors, a Secure Digital (SD) card reader and a Headphone/Microphone Combo Jack. 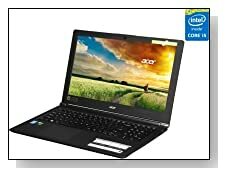 This laptop is priced very competitively as compared to other gaming machines that can cost heaps and you’ll be happy with its performance with most modern games (40-50+ frame rates per second and FHD resolution and some at more than 60fps), the very powerful Haswell i7 CPU it has and 8GB memory and you will have no problems with very heavy multimedia software. 5400rpm mechanical hard drive is the weak link here and it could at least be 7200rpm but the good news is there is an M.2 SATA 2280 slot in it for you to add an SSD if you wish more speed overall and quicker start ups. 8GB memory will meet the great majority of computer customers and if you are an advanced user in need of even larger RAM, system has the capacity to handle up to 16GB- there is an empty slot to add the extra 8GB. There is no doubt you’re getting quite a lot for your money with this new Acer Aspire V Nitro.